Ron Lawlor, a 1993 graduate in graphic design, owns R.E. 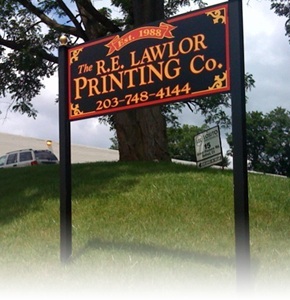 Lawlor Graphics & Printing, a Bethel company that has been a local leader in creative design, printing, advertising and more for over 22 years. His family business offers friendly, prompt service at the most competitive prices. Stop by and see for yourself the R.E. Lawlor family difference. *A full service printing company with craftsmen who take great pride in their work. *Web designs by R.E. Lawlor ensures that you will receive a professional and unique design, simple enough to navigate but distinct and attention grabbing. *Fund drive mailers for non-profit organizations to provide a high profile, low pressure way to raise money.